The hotel is near a variety of businesses as well as shopping areas. Those who stay at this Prague accommodation will be able to visit many of the popular historic sites in the area as well. They can head to Wenceslas Square, the Old Town Square, Prague Castle, and the Charles Bridge. The motorway is close to the hotel, which makes getting to other areas easy. The airport is only a short drive away, and public transportation is plentiful in the area. 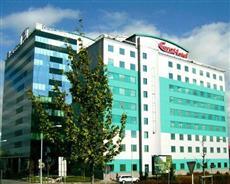 Guests at the Eurohotel Praha will also be able to walk to some attractions. All of the rooms at the Hotel Eurohotel Praha have air conditioning and soundproofing. The rooms also have private bathrooms with showers, desks, chairs, satellite TV, and access to the Internet. The hotel opened in late 2002. Those who arrive at the hotel by car will be able to use the underground parking area as well as ground level parking. The hotel offers a meeting room for those who are on business. Guests can have a drink at the lobby bar.